Seth Schenck is the number one seed in Saturday's 800m final after winning his heat and running the fastest time in Friday’s prelims. Jefferson City, Mo. - New Haven’s girls 4x800m (Hannah Pruessner, Hannah Kruse, Taylor Covington, and Kayla Borcherding) relay team came in third place, grabbing the first state medals for New Haven. Seth Schenck ran a career best time in the 1600m finals, finishing in second place with a time of 4:30.49 and Chamois's Clay Nolte won his first state medal, taking fifth place, running his career best time of 4:36.62. Schenck and Clay will head into the 800m finals on Saturday seeded first and second after today's prelims. Schenck will also run the anchor leg in Saturday's 4x800m relay. 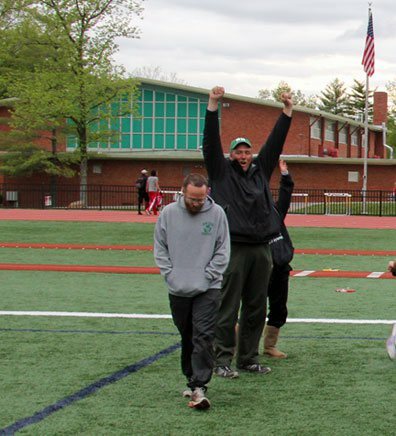 Assitant Track Coach Kevin Sohn’s reaction after the official team results were announced giving New Haven’s girls track team their first district title in school history. New Haven, Mo. - “If you go to a volleyball game....basketball game....cross country meet, coach Sohn is there and I’m not talking just games in this gym. 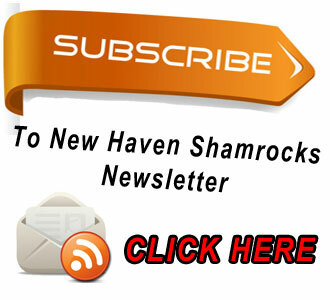 (New Haven) We’ve gone to some of our furtherest road trips and coach Sohn is always there supporting the kids,” Athletic Director Ray Steinhoff said in his opening remarks at last week’s athletic banquet. 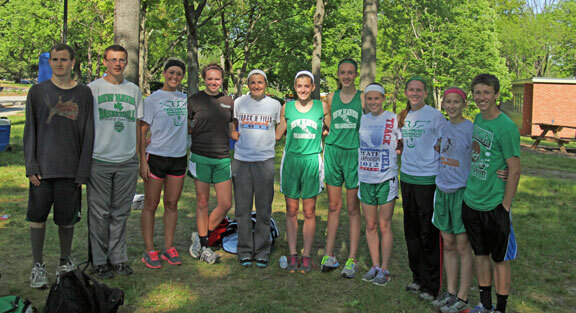 Pictured are 11 of 12 New Haven runners headed to state. Special thank you once again to Principia High School for their wonderful hospitality. Also make sure to thank New Haven High School Students, Fey Chavez and Clara Roth, for all the photos from today's meet. They were a huge help, making it a little easier to keep track of each event and posting results. Principia High School - Take away the wind and it could not have been a better day for runners. Coming into today’s State Sectionals the goal for both New Haven and Chamois was simple; finish in the top four and move on. In today’s first race, New Haven’s girls 4x800m relay team (Kayla Borcherding, Taylor Covington, Hannah Kruse, and Hannah Pruessner) finished second, running a season best 10:17, breaking their previous time of 10:32, and nearly a minute faster than last week at districts. Note: New Haven's Girls time was 10:17 and not 10:37. 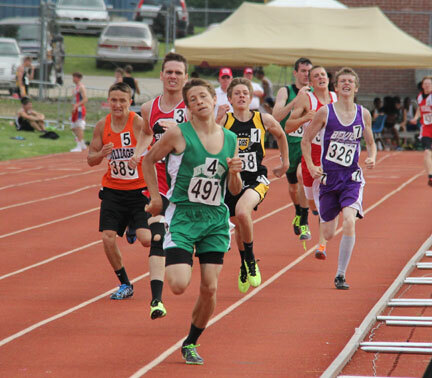 Seth Schenck laps the a runner as he cruises to an easy win in the 1600m by 10 seconds. 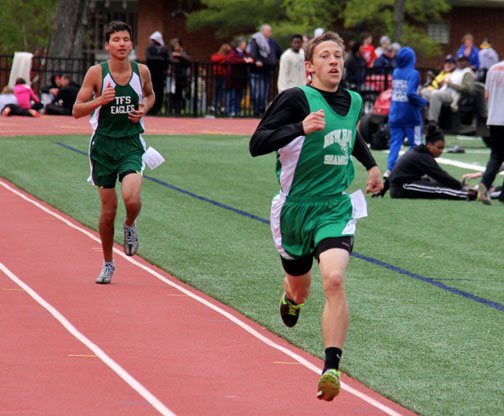 Principia High School - Seth Schenck is a beast who his hungry for state medals after feasting on two first place finishes in the 800m and 1600m in last Saturday’s district meet. Once a runner gets the taste of victory they always come back for seconds and thirds, which Schenck plans to get a second helping on Saturday in the Class 1 State Sectionals. Along with Schenck, Dominick Pataky and Zach Grater finished third and fourth and the opportunity of advancing to next week’s state meet. Keven McDowell will join Schenck, Grater, and Pataky in the 4x800m relay after finishing in second place behind Chamois. 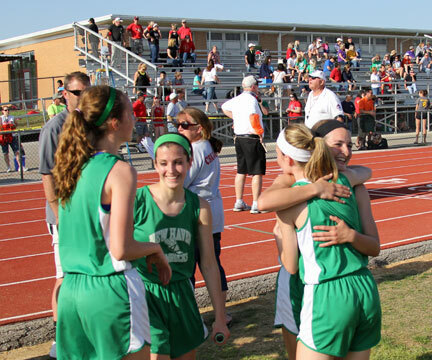 Hannah Pruessner, Taylor Covington, Molly Munsinger, Beth Schenck, and Emily Grater react after it was officially announced they had won districts. Principia High School - Saturday’s district meet ended with New Haven holding the schools first ever girls District Championship plaque high up in the air while taking their victory lap around the track; off in the distance stood Coach John Tucker and Kevin Sohn watching with a slight grin, realizing their girls team was now apart of school history. New Haven’s “feisty 4”, referring to their four relay teams, 4x100, 4x200, 4x800, and of course the 4x400, all advanced into sectionals, taking first place in each event. 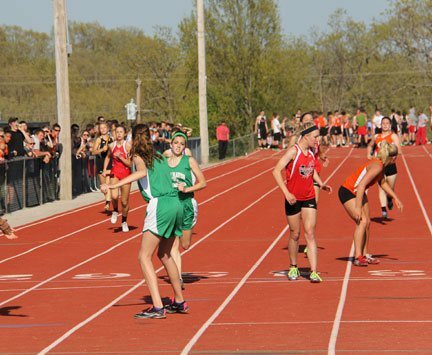 The only relay team challenged was the 4x200 as Silex ran their best time of the year, 1:57.94, but was not enough as New Haven ran a 1:55.45, just 3/10 slower than their season best. 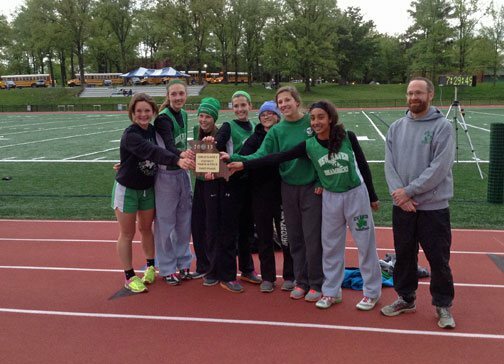 Principia High School - Saturday’s district meet ended with New Haven holding the schools first ever girls district championship while taking their victory lap around the track. New Haven’s final team score of 137 toped Oran’s 101 points. Special thank you to Zach Grater for taking the photo above. We would also like to thank Principia High School for their wonderful hospitality, making it possible for us to provide updates throughout the day. We look forwarding to next Saturday where Princiipia will host the sectionals meet as well. Principia High School - It was another historical meet for New Haven's girls team as they became the first in school history to win a Distirct Title. Chamois' Boys team joined New Haven by winning the Class 1 Boys District Title. New Haven's Hannah Pruessner, who runs the first leg in the 4x400 for New Haven hands it off to Taylor Covington. St. Clair, Mo. – “That’s what I’m talking about, that is what we needed to do…excellent everybody” are the first words Coach John Tucker said to his girl’s 4x400m relay team, Hannah Pruessner, Kierstin Monzyk, Taylor Covington, and Molly Munsinger, after setting a new Four Rivers Conference record with a time of 4:12.93. Just as impressive, all four’s splits were 63 seconds. Helping to put in perspective of Monday’s record time, based on last year’s times at state, they would have won in Class 1, took second in Class 2, and qualified for state in Class 3. After further research, Coach John Tucker just informed us the school record is 4:12.2, however they did break the Four Rivers Conference Record, which is quite an accomplishment with New Haven being the smallest school in the FRC. 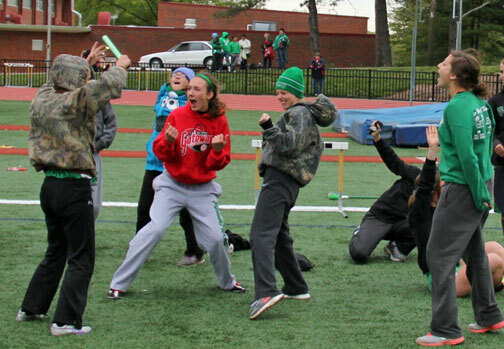 While the school record still stands, the FRC record is now owned by the green and white.